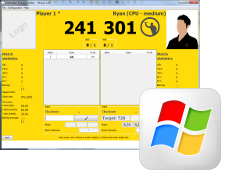 You are looking for a program that assists in your darts training? Darterbase is a platform-independent Java application, which wants to maximize your darts enjoyment while playing darts with your steel dart board. get to know the different darts game variations. play many different training modes and compete against computer opponents. follow and evaluate your own rising skill level based on statistics. strive for fame and honor in a career mode . compete offline or online with your friends. For a compilation of the current functionality in the latest release, take a look here. A new version of Darterbase is ready to be downloaded. Ther was a huge bug in version 1.0.2 which now has been fixed in version 1.0.3! ... and many bugfixes under the surface. Do you like Darterbase? Then it would be very nice if you show your appreciation by spending us a symbolic beer. This will cover the costs to keep the site running, and develop Darterbase. Thank you & have fun with Darterbase!